Back in January in my look ahead for 2011, I said that there would be growth in Q1, but likely a slowdown or stall in Q2 and Q3 due to Oil and Austerian stupidity. The numbers are bearing out that scenario to date. The lead story in monthly numbers this week had to be the +0.5% CPI increase. Prices are already up 1.5% so far this year. While retail sales for March were up 0.4%, inflation means that real retail sales were negative for the first time since last summer. Industrial production did rise strongly, up 0.8%, as did the early April reading of the Empire State manufacturing survey. Consumer sentiment for the first half of April remained sour. The inventory to sales ratio for business was the leanest in years, so business are better able to withstand any slowdown in sales than in a long time. Oil was trading at $109.70 a barrel midday on Friday, the sixtth full week it has been above $100. It remains at a level above 4% of GDP. Gas at the pump increased $.11 to $3.79 a gallon. In the last 6 months, gas prices have gone up a full $1 a gallon. This qualifies as a price shock in my book. Gasoline usage at 9181 M gallons was 1.5% lower than last year's 9325. This YoY comparison has been negative for the last five weeks in a row, although the relative comparison was less bad last week. These indiciators simply leave no doubt that consumers are cutting back due to the shock in prices - yet another example of the early warning given by tracking these weekly indicators in real time. The BLS reported that Initial jobless claims last week were 412,000, the highest in two months. This series has not made a new low in six weeks. The 4 week average is 396,000. Railfax was up 6.2% YoY. Baseline traffic is still barely ahead of last year's levels. Intermodal traffic (a proxy for imports and exports) continued significantly higher last week, driving almost all of the YoY improvement. Waste materials continued below last year's levels (this may be fallout from municipal funding cuts for recycling). Shipments of motor vehicles, however, continued well ahead of last year's pace. The Mortgage Bankers' Association reported a decrease of 4.7% in seasonally adjusted mortgage applications last week. This series has meandered generally in a flat range since last June. Refinancing decreased 7.7%, and with the exception of one week in February is back to its June-July 2010 lows. The silver lining is that refinancing has not hit a new low in 9 months, and applications remain ahead of their level from 11 months ago - the longest such period in the last 4 years. The American Staffing Association Index remained at 92 for the second week, after stalling at he 90-91 level for 7 weeks. This series continues to make no relative headway against its pre-recession peak. The ICSC reported that same store sales for the week of April 2 rose 2.9% YoY, and increased 0.1% week over week. Shoppertrak reported an 8.7% YoY increase for the week ending April 2, reversing the 8.9% YoY decrease of a week ago. It also reported a WoW decline of 3.4%. Unlike almost every other series, these two series' YoY comparisons have been remaining steady or improving over the last month. Shoppertrak cautioned that calendar affects (Easter week this year vs. last year) strongly affected this week's result. The ICSC YoY result is about average for this year so far. Weekly BAA commercial bond rates increased.05% to 6.10%. This compares with a 07% increase in the yields of 10 year treasuries to 3.54%. Over the last 6 months both series have seen higher interest rates, but government bonds have generally been weaker. There is no sign of corporate distress here. Adjusting +1.07% due to the recent tax compromise, the Daily Treasury Statement showed that for the first 8 days in April 2011, $66.2 B was collected vs. $60.1 B a year ago, for a gain of $6.1 B YoY. For the last 20 days, $132.2 B was collected vs. $133.2 B a year ago, for a decline of $1.0B. I suggest using this series with extra caution, because the adjustment for the withholding tax compromise is only a best guess, and may be significantly incorrect. Nevertheless we are beginning to see some losses rather than gains in this metric YoY and that is disconcerting. M1 was unchanged w/w, up 2.0% M/M, and up a strong 13.3% YoY, so Real M1 is up 10.6%. M2 was up 0.3% w/w, unchanged M/M and up 4.7% YoY, so Real M2 is up 2.0%. Real M1 remains strongly in the "green zone," but Real M2 continues its fade into the "yellow zone" below 2.5%. The weekly and monthly series are lining up very much like during last Summer's slowdown. Manufacturing and industrial production are powering forward, while consumer oriented data is stalling. That we had negative real retail sales in March even before the latest spurt in gasoline prices in the last couple of weeks is a particularly poor portent. Despite that, have a nice weekend! Growth is decelerating in the two largest economies as finance ministers and central bankers gather in Washington for the semi-annual meeting of the International Monetary Fund and World Bank starting today. Higher gasoline prices have sapped consumer spending in the U.S., while tighter monetary policy has curbed demand in China. Japan, the world’s third largest economy, is struggling to right itself in the wake of a record earthquake, while Europe is battling a debt crisis that claimed its third victim -- Portugal -- last week. “The headwinds we’ve run into are pretty strong,” said David Hensley, director of global economic coordination at JPMorgan Chase & Co. in New York. “The fundamental forces driving the recovery have not been stopped. We’re bending but not breaking.” JPMorgan Chase sees growth of 4.2 percent this year, down from its 4.7 percent forecast in January. The enduring expansion means that global stock markets are still a buy, even as the world economy “loses some of its acceleration,” said Jim O’Neill, chairman of Goldman Sachs Asset Management in London. “The bull market in equities continues,” he said. He sees the Standard & Poor’s 500 Index rising to between 1,400 and 1,450 by the end of the year from yesterday’s close of 1,314.52. The IMF argues that the rebound has become “more self- sustaining” as increasing private-sector demand replaces waning public support in promoting growth, according to its World Economic Outlook issued this week. “This is not a time for complacency, but the good news is that the recovery is really under way,” IMF Managing Director Dominique Strauss-Kahn said yesterday in an interview on Bloomberg Television’s “InBusiness” with Margaret Brennan. The Washington-based lender forecasts world growth of 4.4 percent this year and 4.5 percent in 2012, after 5 percent in 2010. Expansion expectations nevertheless fell for a second consecutive month in April, according to a Bank of America Merrill Lynch survey of fund managers published this week. Forty-two percent of investors polled also said they see a period of below-trend growth and above-trend inflation. Read the whole things -- it's a great overview. Regular wonky economic blogging will resume shortly, but bear with me briefly while I point out an ultimate truth: all of the blogging, all of the MSM commentary, all of the television punditry, in short every last pixel and paragraph of the monumental sturm and drang of intellectual writhing about federal deficit reduction, and the Grand Intellectual Bargain of trading social insurance for tax increases so entailed, is ultimately so much drivel. No matter how great a part of an envisioned long-term legacy Barack Obama wishes it to be, no "Grand Bargain" struck on his watch will survive even two years past his presidency. In 1987 Congress actually passed a tax simplication act. Many deductions and loopholes were removed in return for lower tax rates. Within a decade a plethora of new deductions and loopholes had returned. In 1993 Bill Clinton and a democratic Congress, without a single republican vote, passed a tax increase which by the end of his presidency resulted in budget surpluses - surpluses that were scheduled to go on as far as the eye could see. Within a year, George W. Bush and his kleptocratic reckless Congress had blown them all up. In 2006 the democrats retook Congress and Robert Reich created something of a firestorm on the progressive blogs by suggesting that the democrats learn from the Clinton experience, and blow out the budget further themselves, but spend the largesse on more populist programs. In short: if the next president after Obama is a republican, there will be another round of monumental tax giveaways to the rich, blowing another huge hole in the budget - exactly as contained in the Ryan plan. For the republican party, fiscal insolvency is a weapon, and any such "grand bargain" is nothing more than winning the first battle in the war to destroy 20th century social programs. If on the contrary the next president is a democrat to the left of Obama, and s/he has a democratic Congress, you can expect the Clinton tax rates or something very similar to return, and increased or restored government spending on social insurance and infrastructure, at very least. So every single bit of hand-wringing angst you are reading boils down to this fundamental truth: are we willing to begin the actual demolition of the crown jewels of Medicare and Social Security in return for the brief glistening of a chimera of deficit reduction on the distant horizon of the future? This is a very good overview of the current state of the US manufacturing sector. What I find really interesting is that despite all the complaints about the decline of US manufacturing, very few pundits are latching onto this success story. The recovery is proceeding in part because of a relatively strong rebound in manufacturing production and employment from the depth of the recession. In 2010, both production and employment in manufacturing industries outpaced growth in the rest of the economy. Strong foreign demand for U.S.-made goods boosted manufacturing exports, which last year made the largest contribution to gross domestic product (GDP) growth since the Second World War. The latest data show that the manufacturing sector has sustained the strong production gains recorded in 2010. Manufacturing output expanded at an annualized rate of approximately 9 percent in January and February. The manufacturing purchasing managers index (a timely and important indicator) remained at strong levels through March. This index encompasses information on production, factory orders, shipments, and inventory data. The rebound of this index in this recovery has been the strongest since the rebound following the deep recession of the early 1980s. A definition of manufacturing—what industries are included in measures of production, for instance. The current profile of manufacturing in America. Here I will comment on the evolution of the sector over recent decades. Manufacturing as a source of employment. And, finally, how manufacturing costs factor into inflation outcomes in the greater economy. For level-setting purposes, I'll define what manufacturing encompasses in the U.S. economy. The sector encompasses a great number of industries and activities, from raw steel production to motor vehicle assembly to water bottling and oyster shucking. Yes, even light processing of products of nature like water and oysters is considered manufacturing. The Department of Commerce has 473 classifications under manufacturing. The manufacturing sector includes establishments such as factories, plants, and mills. Think of establishments as individual sites where manufacturing activity occurs. A company may have multiple sites. There are approximately 340,000 manufacturing establishments in the United States. These establishments produce goods through mechanical, physical, or chemical transformation of various materials, both raw materials and already-manufactured goods. These are transformed into both semi-finished and finished goods. A number of industries—a good example is the auto industry—employ the supply-chain model, whereby lead companies do final assembly as well as product design, brand management, and distribution. Feeding the assembly line are tiers of suppliers who manufacture components. Manufacturers of components, in turn, rely on their producers and suppliers of raw materials. Manufacturing output represents about 11 percent of the U.S. economy in real GDP terms. It may surprise you that this percentage has been relatively constant for several decades. A lot has been written about the growing demand for Chinese-made goods, and China's manufacturing sector is expanding rapidly. Despite China's rapid growth, the United States remains the world's largest manufacturer. According to U.N. data, the United States accounts for one-fifth of global manufacturing output in real terms. That share has held largely constant for the past 20 years. The United States' high share of global manufacturing output reflects to a significant extent the size of the U.S. economy and domestic demand. Although U.S. exports have grown rapidly, the United States is not the world's largest goods exporter. China and Germany export more manufactured goods than the United States. In the current recovery, manufacturing production has grown faster than total GDP. But while GDP has already reached prerecession levels, manufacturing output is still about 10 percent lower than three years ago because of its outsized decline during the recession. Performance within the manufacturing sector has varied widely across industries during the recession and afterwards. Some industries, such as apparel, were in secular decline for many years. Domestic apparel manufacturing was hit hard by the recession and has benefited little from the recovery. Other industries have experienced cyclical swings. Metals production, for example, contracted and then expanded largely in sync with the economy. And a few industries, notably the computer and electronic products industry, rose strongly for many years and slowed only briefly during the recession. Computer and electronic products output is already 20 percent higher than before the recession. Coming back to the long view, while manufacturing output through the years maintained its share of total GDP, manufacturing's share of jobs has steadily declined. In the 1950s, almost one in three payroll jobs was in manufacturing. Today that number is less than one in 10. In terms of absolute employment levels, the number of manufacturing jobs fell by almost five million over the last decade and currently stands at around 11.6 million after remaining relatively stable during the 1980s and 1990s. In contrast, manufacturing output over this period has grown at about the same pace as the overall economy. Obviously, increasing production combined with stable or falling employment is only possible if productivity is rising. Output per worker has increased faster on average in manufacturing than in the overall economy. In many cases, productivity gains in manufacturing have been the result of automation and robotization. In other cases, productivity gains have been realized by reconfiguring production processes, including the offshoring of more labor-intensive, early-stage component production to locations where labor is cheaper. Higher productivity has translated into higher wages. Although employment in the manufacturing sector is much lower than 20 years ago, manufacturing wages remain higher than average wages and have been growing faster. Currently, the average weekly wage in the manufacturing sector is nearly $200 dollars higher than the average for all private industries—double the premium of 20 years earlier. This increased wage premium reflects the changed mix of jobs and relatively higher skill requirements in the manufacturing sector today. I want to summarize manufacturing in very basic terms: its output level is up; output share is steady; employment is down; productivity is up and, therefore, wages are up. That's the manufacturing story in a few words. I am aware there is a lot of angst about the manufacturing sector. In part this is driven by the fact that the sector is no longer the generator of jobs it once was. Realistically, the future of the manufacturing sector depends on its ability to change and reinvent itself in response to global competitive pressures. So far, the sector has done this pretty successfully. In my view, to paraphrase Mark Twain, reports of the demise of U.S. manufacturing have been greatly exaggerated. On the multi-year chart, notice that prices spent over two years consolidating in a triangle pattern, with strong support at the 22 level. Now prices have clearly broken through that level. Remember an old traders adage that the longer the basing formation, the strong the move out of that pattern. Should that play out here, we would have a strong move lower in store. On the shorter chart (6-month), notice the clear lower low and lower high pattern. All the EMAs are moving lower, the shorter EMAs are below the longer EMAs and prices are using the EMAs as technical resistance. This is a great example of the most bearish possible chart out there. The technical indicators tell us that money is flowing out of the market (the declining A/D and weak CMF reading) and that momentum is extremely weak. These simply add to the bearish case. Over the last week, we've seen the dollar form a bit of an island pattern indicating a bounce into the EWAs might be in the cards for the coming week. However, any move higher should be considered a shorting opportunity. The analysis keeps coming -- and all of it basically says Ryan's assumptions are at best a joke. The basic response to the plan from numerous economists is this plan makes no sense whatsoever and is based on a series of economic assumptions that are ridiculous. I have yet to read any analysis that backs up the basic assumptions and projections. Please post in the comments if there is one out there that I've missed. Sales at U.S. retailers rose in March for a ninth consecutive month, easing concern that the jump in food and fuel costs would cause consumers to retrench. Purchases increased 0.4 percent following a 1.1 percent February gain that was larger than previously estimated, Commerce Department figures showed today in Washington. A report from the Labor Department showed job openings in February jumped by the most in six years. Declining unemployment and a cut in payroll taxes for 2011 are helping sustain sales at chains like Macy’s Inc. (M) and Saks Inc. (SKS) At the same time, mounting gasoline and grocery bills are eroding confidence and straining paychecks, making it likely consumer spending, the biggest part of the economy, cooled in the first quarter from the final three months of 2010. Paired with a weak report on businesses' restocking of inventories, also released Wednesday, and lackluster news earlier this week on U.S. trade, the latest data prompted some economists to revise down their estimates for first-quarter growth. Barclays Capital cut its estimate to 2%, down from 3.5%, while JP Morgan said it now sees gross domestic product growing only 1.4%, rather than 2.5%. "Much of the disappointment owes to softer consumer and capital equipment spending," JP Morgan economists wrote in a note to clients. I'd rate the report a 6 on a scale of 1-10. The good news is retail sales continue to increase. And ex-autos, sales were up .8%. Most impressive, however, were the increases in home improvements/furnishings. Furniture was up 3.6%, electronics were up 2.1% and building materials/supplies were up 2.2%. Also note that food services were up 1%. This data tells us the consumer -- at least so far -- is actually pretty resilient in the face of rising gas prices. On the above chart, first notice the left had YOY percentage numbers. These are very low -- in the realm of 2.5%-5%. However, consider these changes on a relative basis. If the economy is used to a 0% YOY increase in food prices and then prices start to increase between 5% and 7.5% on a YOY basis, people will start to notice the change. 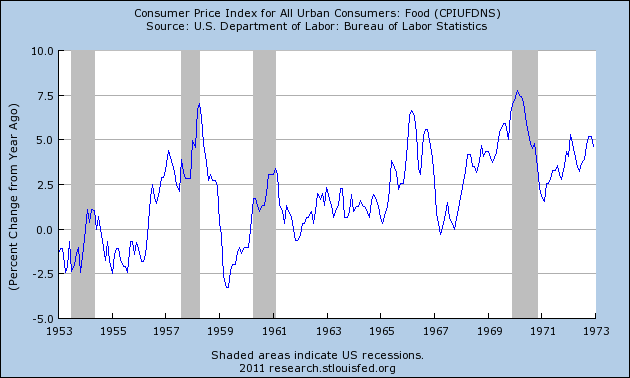 Food prices spiked at the end of the recession of 1953. 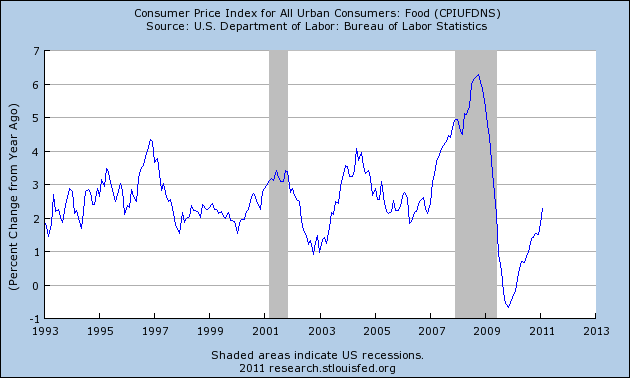 However, this indicates food inflation was an ancillary event during that recession. However, the year over year percentage changes for the recession of 1957 and the end of the 1960s were large on a comparative basis and probably contributed to the slowdown. 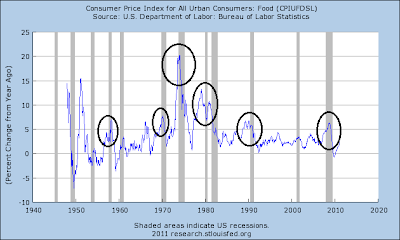 On this chart, the first point to make is to take the different left handed scale into consideration -- now we see YOY price increases of 20% before the early 1970s recession and YOY price spikes of over 10% for the double dip recession at the beginning of the 1980s. The YOY increase prior to the 1990s recession was around 5%. While this is high, the oil spike caused by the Iraq war was probably the leading cause of that recession. Finally, notice the scale has again changed to smaller numbers. While we saw the YOY number increase prior to the early 2000s recession, the increase only reached 3%. In addition, this number was actually higher during the expansion, indicating an increase of 3% probably wasn't enough to be a primary cause of the early 2000s recession. However, the price spike before and during the last recession leads to the conclusion that food price spikes were at least a contributory cause of the recession (although obvious other factors such as the near-collapse of the US financial system were undoubtedly the leading cause). While food prices get less headline space than gas prices, they appear to be no less important in contributing to recessions over the last 60 years. Last week, I wrote that I expected upside gains on oil to be limited, based on higher oil prices denting demand, the then increasing possibility of a Libyan resolution and China's efforts to cool their economy. I also stated that $110/bbl was a a price level to watch out for. I clearly misjudged the Libyan situation, as the fighting continues and an oilfield fire on Friday helped spur prices above the 110 level. The dollars decline is also helping to move prices higher. However, the average retail price of gas continues to increase, and is currently at $3.68/gallon. In addition, there is ample supply in the US and energy inflation is starting to negatively impact consumer sentiment. 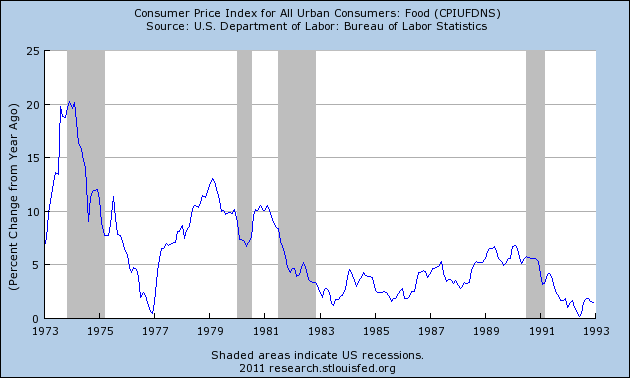 On the 5-year chart, remember that prices are still in a clear upswing. Prices bottomed at the beginning of 2009 and have been in a general, long-term rally since. Recently, prices have broken above the $90/bbl level in a strong rally, printing strong bars and moving above resistance in a convincing manner. However, this move has led to fundamental concerns, perhaps putting a limit on oil's upward moves. The 6-month chart shows two upward sloping lines. The first, started at the end of November and has a slight angle, while the second started at the end of March and has a much stronger angle. 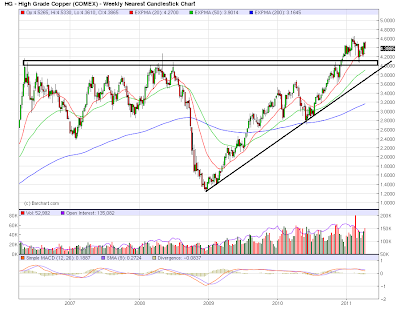 Also note the EMAs are very bullish with the shorter above the longer. However, the MACD has printed decreasing peaks and prices are right at technical support. A move breaking the current trend line would lead to a price target of the 50 day EMA. The daily chart shows prices breaking support, moving lower, and then consolidating losses. 1.) Once commodity prices hit a certain level, they naturally start to constrict economic growth. Economists are guessing we're at that price level now -- or at least a lot closer to it than before. 3.) Crowd following behavior: I bought the commodities with the crowd, I'll sell them with the crowd. Never mind that Shadowstats has been debunked. Let's assume that inflation is actually at 9.6%. That means the entire Treasury market is underwater by a little under 6% or 600 basis points. While the markets may not be perfectly efficient, they are not that inefficient either -- not by a long-shot. I haven't watched CNBC for a long time -- as in years. Now I now why. They are a financial news channel that doesn't know anything about finance. When the cost of food rises, does the CPI assume that consumers switch to less desired foods, such as substituting hamburger for steak? No. In January 1999, the BLS began using a geometric mean formula in the CPI that reflects the fact that consumers shift their purchases toward products that have fallen in relative price. Some critics charge that by reflecting consumer substitution the BLS is subtracting from the CPI a certain amount of inflation that consumers can "live with" by reducing their standard of living. This is incorrect: the CPI's objective is to calculate the change in the amount consumers need to spend to maintain a constant level of satisfaction. Specifically, in constructing the "headline" CPI-U and CPI-W, the BLS is not assuming that consumers substitute hamburgers for steak. Substitution is only assumed to occur within basic CPI index categories, such as among types of ground beef in Chicago. Hamburger and steak are in different CPI item categories, so no substitution between them is built into the CPI-U or CPI-W. Furthermore, the CPI doesn't implicitly assume that consumers always substitute toward the less desirable good. Within the beef steaks item category, for example, the assumption is that consumers on average would move up from flank steak to filet mignon if the price of flank steak rose by a greater amount (or fell by less) than filet mignon prices. If both types of beef steak rose in price by the same amount, the geometric mean would assume no substitution. 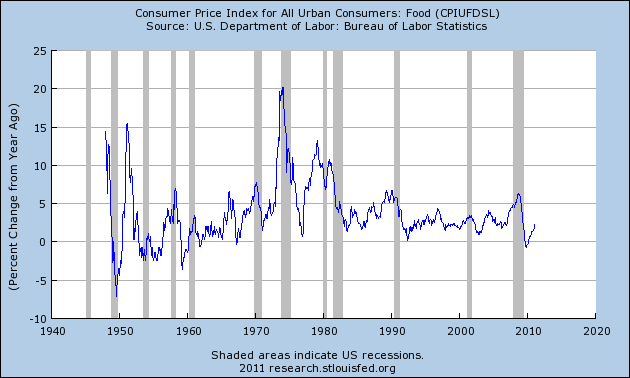 Is the use of "hedonic quality adjustment" in the CPI simply a way of lowering the inflation rate? No. The International Labour Office refers to the hedonic approach as "powerful, objective and scientific". Hedonic modeling is just one of many methods that the BLS uses to determine what portion of a price difference is viewed by consumers as reflecting quality differences. It refers to a statistical procedure in which the market valuation of a feature is estimated by comparing the prices of items with and without that feature. Then, for example, if a television in the CPI is replaced by one with a larger screen and higher price, the BLS can make an adjustment to the price difference by estimating what the old television would have cost had it had the larger screen size. Many of the challenges in producing a CPI arise because the number and types of goods and services found in the market are constantly changing. If the CPI tried to maintain a fixed sample of products, that sample quickly would shrink and become unrepresentative of what consumers were purchasing. Each time that an item in the CPI sample permanently disappears from the shelves, the BLS has to choose another, and then has to make some determination about the relative qualities of the old and replacement item. If it did not--for example, if it treated all new items as identical to those they replaced -- significant upward or downward CPI biases would result. Critics often incorrectly assume that BLS only adjusts for quality increases, not for decreases, and that hedonic adjustments have a large downward impact on the CPI. On the contrary, BLS has used hedonic models in the CPI shelter and apparel components for roughly two decades, and on average hedonic adjustments usually increase the rate of change of those indexes. Since 1998, hedonic models have been introduced in several other components, mostly consumer durables such as personal computers and televisions, but these newer areas have a combined weight of only about one percent in the CPI. A recent article by BLS economists estimated that the hedonic models currently used in the CPI outside of the shelter and apparel areas have increased the annual rate of change of the All Items CPI, but by only about 0.005 percent per year. Has the BLS selected the methodological changes to the CPI over the last 30 years with the intent of lowering the reported rate of inflation? No. The improvements chosen by the BLS that some critics construe to be a response to short term political pressure were, in fact, the result of analysis and recommendations made over a period of decades, and those changes are consistent with international standards for statistics. The methods continue to be reviewed by outside commissions and advisory panels, and they are widely used by statistical agencies of other nations. Moreover, the sizes and effects of the changes implemented by the BLS are often over-estimated by critics. Some have argued that if the CPI were computed using the methods in place in the late 1970s, the index would now be growing at a rates as high as 11 or 12 percent per year. Those estimates are based on the belief that the use of a geometric mean index lowered the annual rate of change of the CPI by three percentage points per year, and a belief that other BLS changes, such as the use of hedonic models and rental equivalence, have lowered the growth rate of the CPI by four percentage points per year. I want to continue looking at energy prices and their effect on the economy, this time focusing on energy prices and GDP. 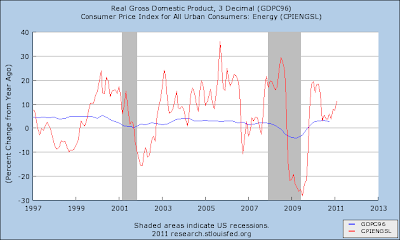 The following charts all use the energy component of CPI and the real (inflation-adjusted) GDP figure from the BEA. I've broken each of these charts down into 20 year segments to better show the relationship between energy prices and GDP. 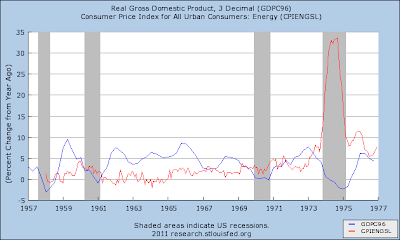 From 1957-1977, the US economy could handle YOY energy price swings of 10% and still have positive GDP growth. However, in the early 1970s energy prices increased over 30% on a YOY basis which had a strong negative effect on the YOY GDP growth and helped to cause the recession that ended in 1975. 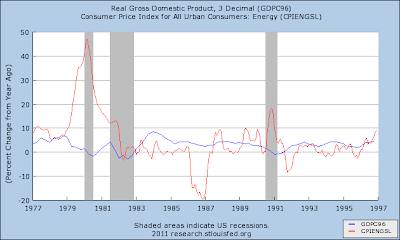 The chart from 1977 to 1997 shows two more periods when a large increase in the YOY percentage change in energy prices led to a recession. 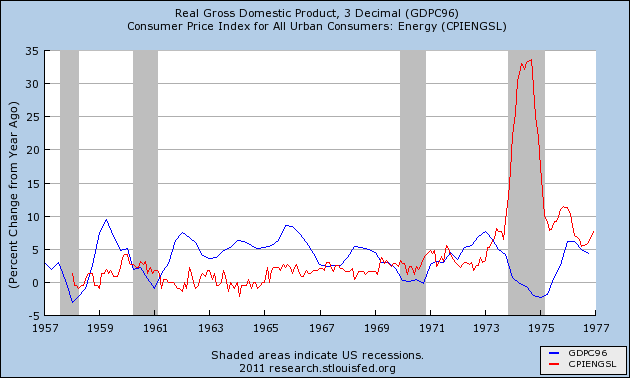 Energy prices spiked nearly 50% in the late 1970s, leading to one and probably the second recession. 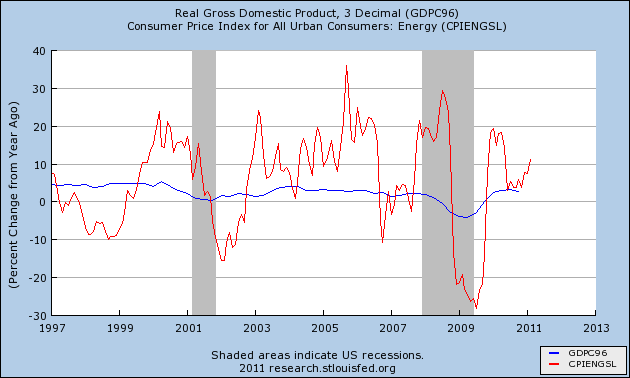 Energy price also spiked nearly 20% on a YOY basis during the recession that occurred in the early 1990s. However, the YOY spike occurred during the recession rather than before it. However, the fact the country went to war quickly may have had something to do with that slowdown. 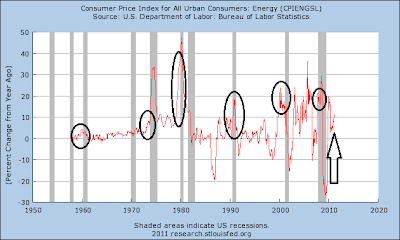 The above chart shows that energy prices have become far more volatile over the last 15 years. However, note this volatility does not always lead to recession. During the expansion earlier this decade, oil prices rose at historically high year over year rates, yet the economy did not fall into recession. The above charts show that over the last 50 years, energy prices have become more volatile. But -- just as importantly -- the economy has developed the ability to absorb the extreme shocks. This does not mean absorbing the volatility is easy. In fact, I would argue it probably hinders growth to a mild extent. But recent evidence indicates it is not fatal. The five year copper chart shows that prices are in a strong uptrend and are also above the highs of the last five years. The 4-4.2 price area had been providing strong upside resistance over the long-term, but prices have moved through that resistance. The EMAs are very bullish -- the shorter are above the longer and all are moving higher. However, the MACD is fairly weak for a chart in this type of bullish posture. Ideally, we'd like to see a stronger move higher. However, notice the MACD has been in a fairly flat position for most of this rally so this is not a deal killer. Also note that after breaking through to new highs, prices consolidated gains by moving back to previous levels only to now bounce higher. 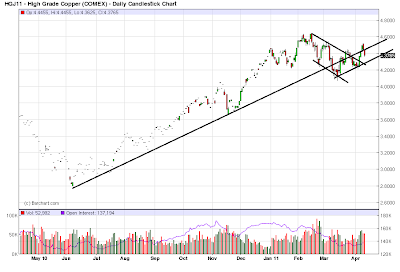 But -- unlike the QQQs latest move -- copper prices advanced a bit after moving through resistance before moving lower. The main point with the yearly chart is how prices have recently formed a downward sloping pennant pattern and are now moving between the one year trend line and a lower trend line. Prices are having a hard time betting above the longer trend line. The shorter chart shows the latest action in more detail. 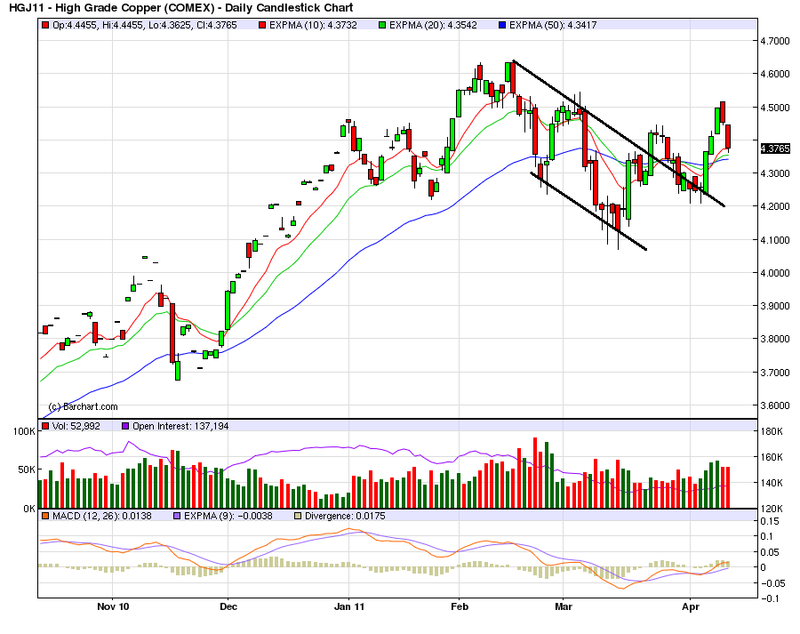 Prices have broken out of their downward sloping channel, but they're not exactly in a strong move higher either. The EMAs are in a tight bunch and have been for about a month. The MACD has given a buy signal, but its upward angle is fairly weak. This chart shows a fairly indecisive mrket. But Chinese buyers are now facing the double whammy of higher copper prices and the government's aggressive moves to tighten credit. Moreover, evidence has recently surfaced of previously unreported copper stockpiles, a sign that much of the purchased copper hasn't been put to use. The stash is estimated by people in China and several Western banks to be around one million tons, or about 15% of the country's annual consumption. Copper is closely watched and has been given the nickname "Dr. Copper" because it is a proven bellwether for the health of the global economy. Since the metal is used in myriad industries, a strong demand often indicates that the overall economy is expanding. Since reaching an all-time high of $4.6230 a pound on Feb. 14, copper's rally has stalled. At one point, the metal was down 11% from its high, though it has clawed its way back and closed at $4.4950 Friday on the Comex division of the New York Mercantile Exchange. Official commodity inventories aren't readily released by China's government, forcing industry watchers to resort to other means—either physically scouting warehouses themselves or finding government sources—to try to determine just how much copper has actually been used. The task has become even more daunting recently because companies and individuals have been hoarding commodities of all types—from cotton and copper to cooking oil—betting that prices will rise. With little insight into the stockpiles, analysts tend to overestimate China's real strength of consumption. In late March, the market got a rare glimpse at the size of the potential copper overhang when the China Non-ferrous Metals Industry Association, a government-backed trade group, indicated the levels across the country could be as much as one million tons. "The risk is that you end up with this overhang, which finally finds its way back" onto the market, said Leon Westgate, a London-based analyst at Standard Bank, who took a field trip to China last month to scout warehouses. He said he saw a glut of copper in warehouses just along the coast, which he estimates at about 700,000 tons. That "intensified" his negative feelings about copper, he said. Alphaville also has some stories on this situation. 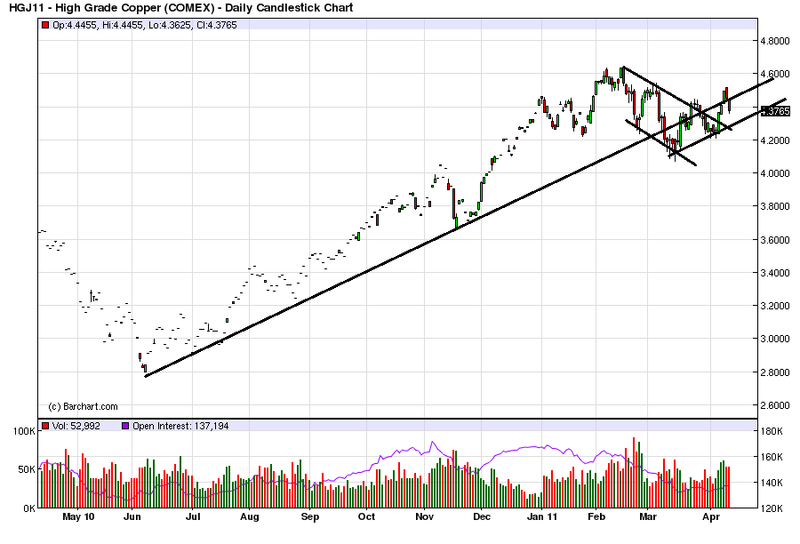 The data indicates there may be a fair amount of speculative excess built-into copper's price right now, which would lead to at best sideways movement for the next few weeks. Also note there are caution flags on the fundamental side. China is raising interest rates, and Japan's supply chain is broken. 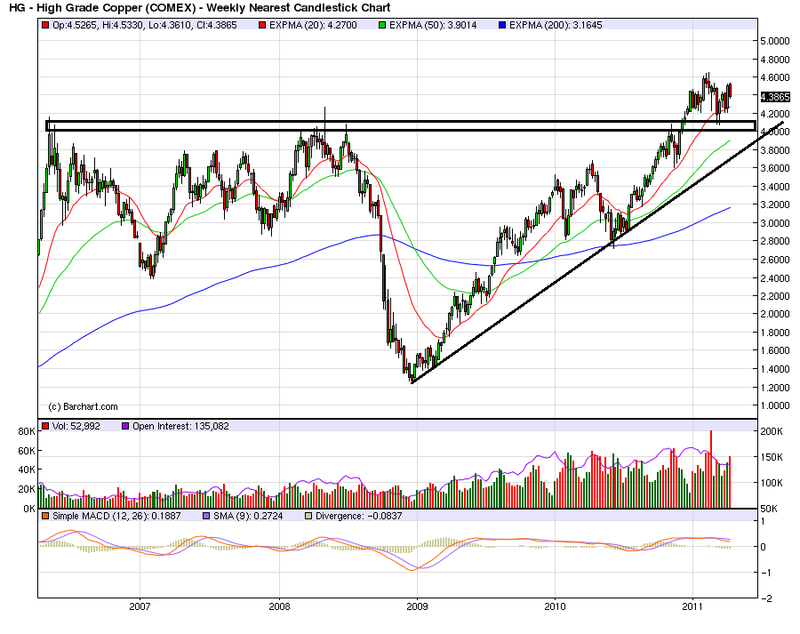 Both of these factors could lead to a slowing of the world economies, lowering the demand for copper. For anybody who has actually looked at the numbers (and shut out the talking heads), this is old news. The last time I seriously studied the issue (about 2 years ago), the numbers were striking. Our system is bloated and ineffective compared to the "socialized" medicines of the EU and Asia. Logic would dictate that we should adopt the system that is cheaper and more effective. However, logic left our discourse a long time ago. Growth in railroad-shipping volume shows the U.S. economic expansion is gaining momentum, even with rising energy prices in the first quarter. Total rail volumes excluding grain and coal shipments rose 7.9 percent to 4.6 million carloads in the quarter ended March 31, according to data compiled by the Association of American Railroads in Washington. It was the second-highest increase in a first quarter, following last year’s 9.3 percent rise. “This is almost double the first-quarter growth rates of the last economic recession, during the 2003-2006 recovery period,” said John Mims, a transportation analyst in Richmond, Virginia, at BB&T Corp. Rail volumes were on the “high end” of his expectations for the first quarter, and his projections for the second quarter assume the pace of volume recovery will continue. Rail-car shipments that exclude coal and grain, such as chemicals and metals, represent the bulk of materials that go into industrial production, so an increase in volumes bodes well for the broader economy, Mims said. “We’ve had no indications from the rails that they’re pulling back on their projections for strong commodity shipments throughout the year, which is a strong indication that industrial production will continue to improve,” Mims said. The same report showed widespread price increases impacting many groups. This chart shows some very interesting characteristics. 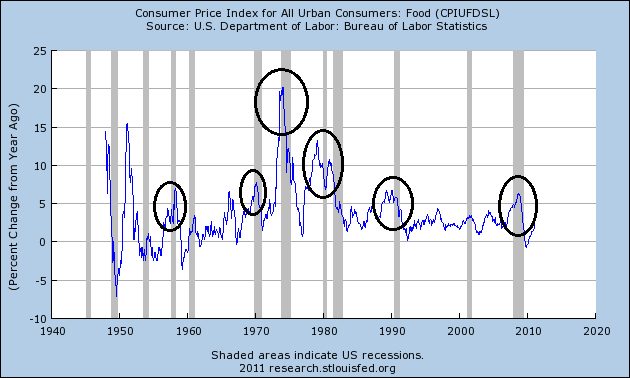 First, note how prices have become more and more volatile. In the 1960s energy prices were constant. In the 1970s we experienced two oil price shocks that led to recessions. Also note that the YOY number started to print higher numbers. Prices settled down at the beginning of the 1980s, but then became more volatile as the 1990s approached. Note the big run up in prices at the end of the 1990s and the heightened volatility that occurred in the 2000s. 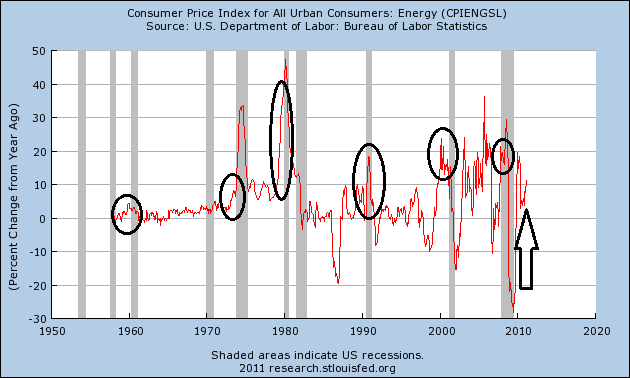 Energy prices spiked in relative terms before six of the last recessions -- a point that has been researched in-depth by Professor Hamilton over at EconBrowser. Perhaps most importantly, notice the current YOY percentage change -- while high -- is lower than other recent times when a recession followed. Prior to the early 2000s recession and the latest recession, oil prices hit a YOY percentage change of 20% while currently the YOY percentage change is only at 10%. For more of Professor Hamilton's work see this article and this PDF link. Something I did not mention, but will add, is the increased perception regarding inflation. Gold and silver are making new highs, and the TIPS-10-year spread is high, indicating traders are concerned about inflation. Nothing has changed my opinion that the Treasury market is heading lower. In fact, last weeks action simply confirms my feelings about this move. Prices on the IEF are in a clear downtrend, and have been since mid-March. Also remember that mid-March's bounce was purely driven by short-term fundamentals, caused by the political unrest in the Middle East. Prices are now below the 200 day EMA, and the shorter EMAs are below the longer -- although this development is new and shouldn't be considered too heavily in trading calculations. However, prices have printed three weak candles the the last three days on weakening volume, indicating prices might be looking to rebound and test the EMAs, providing a good opportunity to short the market. The TLTs hit upside resistance at the 200 day EMA and have been moving lower since. They broke through their upward sloping trendline, became entangled with the EMAs and have been moving lower ever since. Note the long downward bar printed four days ago. Like the IEFs, prices have printed smaller candles over the last three days, which may be signs a a reverse where prices rebound and move into the EMAs. The underlying technical indicators for both the IEFs and TLTs are very bearish. Both are showing a net-outflow of cash in the form of decreasing A/D and CMF lines. It's very helpful that both of these indicators are moving lower; sometimes the A/D line will move sideways while the CMF shows weaker levels, giving a mixed (and confusing) reading. In addition, momentum is clearly decreasing on both ETFs with the MACD having a way to move lower. Going forward, I expect the Treasury market to continue moving lower for the following reasons. 1) QE2 is ending on June 30th. The program will, by that time, have pumped $600 billion into the economy, meeting Chairman Bernanke’s stated goal of jump-starting the stock market. The end of the program means a defacto tightening of monetary policy. 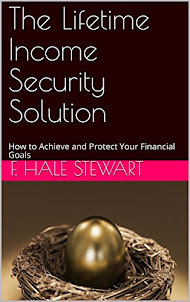 This has been the major factor holding up both the stock market and a fragile economy that will not be self-sustaining once the Treasury bond purchases are halted. A continuation of quantitative easing is highly unlikely as it would be politically difficult. Furthermore an increasing number of FOMC members are themselves hinting at a possible imminent tightening. 3) A broad array of commodity prices is rising. This is increasing corporate costs at a time when they will be difficult to pass on as consumers are strapped for income and are paying down debt. This is bound to squeeze profit margins in the period ahead and result in downward earnings guidance. 4) The Mid-East turmoil is continuing and showing no signs of lowing down. Although the eventual outcome is unknown, it is doubtful that it will be market-friendly. 5) The European Union (EU) is another major problem. First the authorities tried to build a firewall around Greece, second around Ireland and now around Portugal. These are relatively small economies, and the EU can probably “kick the can down the road” one more time with no real solution in sight. Now they are attempting to build a wall protecting Spain, a nation said to be “too big to fail and too big to rescue”. If Spain follows the lead of Greece, Ireland and Portugal, the results could be catastrophic to the global financial system. In the midst of these events the EU has also raised interest rates, a move they last made in the summer of 2008 just prior to the credit crisis. 6) China is battling against soaring inflation and has increased interest rates four times in the last five months in an attempt to slow down the economy. No financial bubble has ever been stopped without a recession, and we doubt that this will be the first. This would have major ramifications on the global economy including the commodities markets, emerging market suppliers, multinational corporations and the U.S bond market. 7) The Japanese earthquake is yet another headwind to the economy. Toyota is shutting down all of its American factories, and American vehicle manufactures are facing parts shortages as well. According to AutoNation, “production disruptions will significantly impact product availability from Japanese auto manufacturers in the second and third quarters.” We’re hearing about supply disruptions in a number of other industries as well. We won’t be surprised to hear numerous companies comment on this issue when they report first quarter earnings and give guidance for the rest of the year. policy actions given their objective, policymakers need to know the current rate of inflation and where it is headed. What makes for a reliable predictor of future inflation has been debated throughout the years and continues to be the subject of economic analyses today. One debate that has received attention recently is whether the focus should be on headline or core inflation. The former is calculated from an all-item index, whereas the latter is commonly calculated from a price index that excludes the highly volatile food and energy components. Central bankers around the world have taken both sides of the debate. For instance, the inflation goals of the European Central Bank and the Bank of England are explicitly stated in terms of headline measures, and their policymakers pay less attention to core measures. In contrast, the Federal Open Market Committee (FOMC) focuses on inflation that is derived from the personal consumption expenditures price index excluding food and energy ("core PCE"). This does not mean, however, that the FOMC ignores headline PCE. In fact, since 2008 the FOMC has reported its forecasts for both core and headline inflation in the semiannual Monetary Policy Report to the Congress. At the end of the day, the Fed's main concern is long-run headline inflation and the prices people actually pay. A natural question to ask, then, is: If the Fed ultimately cares about overall prices, why would it ever look at core inflation, thereby excluding items on which Americans spend a nontrivial portion of their income? The reason is because, historically, the food and energy components were highly variable (for example, due to temporary supply disruptions), and their large price fluctuations were usually expected to correct themselves within a relatively short period of time. Consequently, the FOMC focuses on core PCE as a measure of underlying inflation trends and, thus, a predictor of future headline PCE inflation. Assuming core PCE is an appropriate measure to use, we would expect to see headline inflation fluctuate above and below core inflation over the short run. As I discussed in a 2007 commentary, the relationship seemed to break down in the mid-2000s when there was persistent divergence in headline and core inflation rates.1 Measured on a year-over-year basis, headline PCE remained higher than core PCE from 2002:Q4 to 2006:Q3. During that period, the divergence was largely driven by rapid economic growth in Asia; the rising global demand for commodities caused their prices to rise faster than other prices, putting upward pressure on headline inflation. During the financial crisis and recession, the expected patterns re-emerged—headline PCE inflation fluctuated around core PCE inflation. But now that the economy is recovering again, do we see the mid-2000s trend reasserting itself? 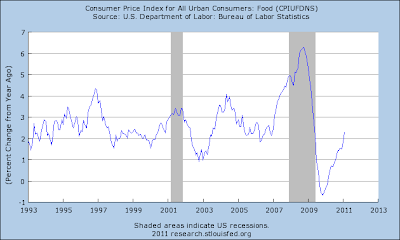 Since June 2010, the two measures have been diverging slowly, with core inflation below headline. It is too early to tell if the divergence reflects another persistent increase in the relative prices of global commodities or if the divergence is more temporary. Given the strong growth rates of emerging economies during the global recovery, though, the divergence in the two inflation measures deserves close attention. What would it mean for monetary policy analysis if the FOMC does expect headline and core inflation to continue diverging in 2011 and 2012? As I asserted in my previous commentary, one interpretation is that, during times of continuous increases in the relative price of energy, perhaps core PCE is a misleading indicator of underlying inflation trends. This implies that core PCE may not be a good predictor of future headline inflation after all. Under these circumstances, headline PCE inflation should probably have more weight in policymaking decisions than core PCE inflation. Of course, if the evidence shows that core PCE is not the best measure to focus on for policy purposes, exploring other options may make sense. One alternative measure could include all components but put less weight on those that have highly volatile prices. Such a measure would avoid systematically excluding certain prices and would more accurately reflect consumers' expenditures. Additionally, studies have shown that other existing "core" measures, such as PCE trimmed-mean or PCE weighted-median inflation, may be better predictors of headline PCE inflation than core PCE.2 In the end, the policymakers' goal is to use the inflation measure that helps them achieve low and stable headline inflation in the long run. The economy is doing well. Only the people are suffering. This week March retail sales, industrial production, and capacity utilization will be reported. These measures of the economy, like many others, have shown a strong rebound, regaining in real, inflation-adjusted terms half or more of the ground lost since the bottom of the "Great Recession." In fact, several other labor-oriented metrics - real income and aggregate hours worked - have also shown recent strength. That strength, however, masks the underlying continuation of poor conditions faced by the individuals who make up the labor force. While there is no denying the improvement since the bottom of the "'Great Recession," there are still more than 10% fewer hours avaialable to be worked in the economy per capita compared with the top of the 1990s expansion. This is yet another measure of how lackluster the 2000s expansion was. More importantly, we are still close to the absolute worst situations in the last half a century. So while the economy as a whole is doing much better, the labor force and in particular the millions of unemployed and underemployed continue to suffer. Last week, I stated I believed the market would be moving sideways for the next week/month, largely because of a slowdown in the overall economy. In addition, the latest "rally" has been on very weak volume, indicating a lack of overall participation. While the IWMs have broken out to new highs, there has been no follow-through from the QQQs or SPYs, and the SPYs chart has been printing some very weak candles. None of these conditions has changed over the last week. For the last week, the SPYs have printed very weak candles and have stalled at important resistance levels. The volume has been weak. While the EMAs are bullishly aligned, my feeling is the weak volume and fundamental backdrop trump. Although the QQQs have moved through resistance, they immediately formed a downward sloping pennant pattern after doing so. This lack of follow through indicates a firm lack of conviction on the part of market participants to take the market higher. Also note the lack of volume. The Transports broke though key resistance, but then promptly fell back to the EMAs. Notice that Friday's bar was very long and on slightly higher relative volume. The IWMs have been leading the market higher for the last 6 months or so. However, after breaking through resistance, they have also fallen, printing a large down candle on Friday. Also note how the last three downward bars also printed higher volume, indicating more participation on the sell-off than the rally. Going forward, I still expect the equity markets to perform in a lackluster manner. The SPYs have hit resistance in the 134-134.5 area -- an area that I expect to continue providing resistance. Also note the the QQQs, IYTs and IWMs have not followed through on any of their respective rallies. I'm also expecting to see weaker prints of the economic numbers for the next few weeks, reflecting the impact of higher oil prices, the EU situation not being resolved, the aftermath of Japan's earthquake and China's continued move to increase interest rates.